Anxiety is an intense fear or dread that lacks a specific cause. Severe anxiety attacks are often accompanied by physical symptoms. Anxiety Free Living is designed to relieve those desperate fears that trigger anxiety. 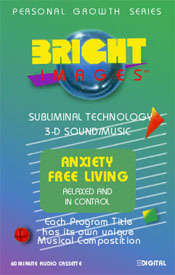 This program helps to control the symptoms of anxiety, brings about a calm relaxed, anxiety free condition. You will see yourself as a calm, relaxed person who controls excitement and pressured situations. It promotes regular exercise, instills confidence in making decisions and builds a positive attitude of happiness, mental health and a relaxed person who is in control.